Watching clouds float by is usually a serene, relaxing experience. 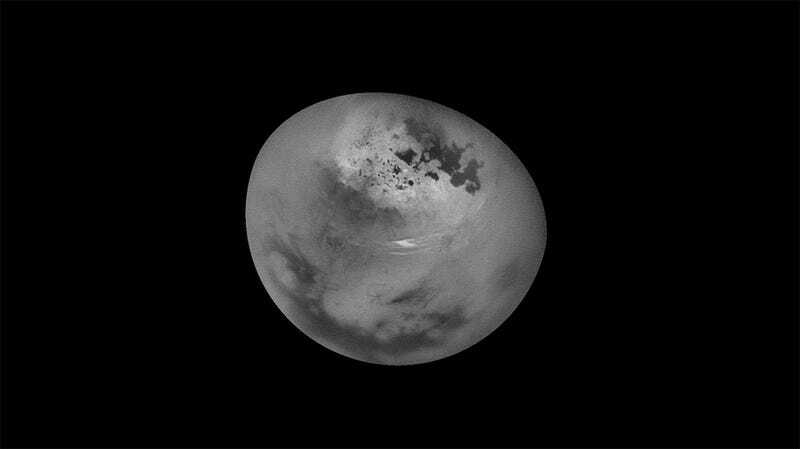 Watching methane clouds float by on Saturn’s moon Titan, however, is not. NASA recently released a new video captured by Cassini, a spacecraft currently making its way around the Saturnian system. The footage—which is set to some pretty dramatic music—shows the methane clouds developing, moving, and disappearing over an 11-hour span. It’s not terrifying, exactly, but it is a little strange to watch. Most prominent are long cloud streaks that lie between 49 and 55 degrees north latitude. While the general region of cloud activity is persistent over the course of the observation, individual streaks appear to develop then fade. These clouds are measured to move at a speed of about 14 to 22 miles per hour (7 to 10 meters per second). Cassini is expected to chug along until next September, at which point it will—I hope—float on toward the raging dead spacecraft party in the great beyond.